1) Bottom Bracket Shell – I went with lugless 68mm english thread – steel. This is probably the most common threading and diameter. NOTE: this shell did not end up being wide enough for rear disk brake clearance… Note that the height of the shell also counts. Make sure that you decide which bottom braket you want to use and choose your shell accordingly. Each crank has a specific type of bottom braket, so make sure you check that too! When you buy your bottom braket go to a good bike shop and ask for help figuring out the right spindle length, you need the chain to run straight. IMPORTANT: Most (except for Italian and obsolete French) designs use right-hand (normal) threading for the left side and left-hand (reverse) threading for the right (drive) side. I used the dremel reinforced cutting disks to cut it down to the right length. I would recommend doing this before building the joints. Alternatively you can look at the side projects posting on this blog and find a description of how to make a hemp fiber headtube. Go to the “sinking the seat” page for more detail on how to handle your seatpost. NOTE: don’t use your bamboo seat tube to bind the seatpost in place with a clamp…. I have seen someone else’s cracked bamboo seat tube…. You should either fix the seat directly to the bamboo or better yet sink some metal into the bamboo seat post and use that to clamp the seat post in place. Again go to the “sinking the seat” page. NOTE: Metal seat tubes almost always come with a taper. Make sure that you figure out which side works with your seatpost diameter. 4) Dropouts – I would recommend something like this. Although Im not of fan of track style dropouts but what you are looking for is longer arms so that you have more room for error and more metal to sink into your poles. Also keep in mind that each bottom bracket has its own fixed angle (angle where seatstays meet chainstay). Drivetrain Issues with dropout styles: If you plan on having a fixed or single speed bike read this. For fixed gear bikes (or coaster brake): you have to be able to tension the chain so that it does not slip (forward or back). The amount of horizontal movement determines your ability to tension the chain. So for a fixed gear (or coaster brake) horizontal or track-style dropouts are ideal, but semi-vertical can work but might require some filing or the use of 1/2 links for your chain. Note however that track ends can be a bother since you might have a readjust or remove your brake in order to remove your wheel. Another option is the use of an eccentric bottom bracket (requires a special BB shell, or an eccentric rear hub) For single speed bikes: if you have a derailer hanger you can use a chain-tensioner (cannot be used w. fixed or coaster brake!). So you can use any type of dropout (just make sure you have a derailer hanger). For a lot more detail see the best damned bike site on the web, Sheldon Brown’s Bike Site. NOTE: – You might consider bending the lower (chain stay) arms of your dropouts outward. This will ensure that you can get proper clearance for a large (9 speed) cassette and or disk brakes. 5) Any add-ons you might want, water bottle bosses, cable guides, or maybe brake bosses for v-brakes or cantilevers. Steel – sure its harder to come by but you can always buy it. Steel is more pliable, which could come in handy, and does require anything more than a good sanding to join with epoxy. I have been having a bit of trouble with the epoxy bonding to the surface of steel so I looked at the west systems site. Here is what they say to do: “Remove contamination, sand or grind to bright metal, coat with epoxy then sand fresh epoxy into surface. Re-coat or bond after first coat gels.” So I guess I wasn’t doing it right. Surface prep can’t be overlooked. It is critical that all the surfaces bond properly together. Since bamboo is an waxy wood you need to make sure that you both attempt to sand down the poles where you will be bonding them until the dull brown fibers are exposed. Believe me the epoxy does not bond well with a waxy surface. You then need to strip the surface further with a strong solvent. West systems suggests using acetone, this stuff is toxic as hell so use it outside and with your respirator if you have to. Apply and attempt to remove any extra wax 15 mins before applying epoxy. One alternative is biosolve by mas epoxy. This stuff is much better over environmentally. Since I had trouble fitting a disc rotor on my rear wheel and used vertical dropouts (can’t use fixed gear or a coaster brake [the kind of bike you grew up on, pedaling backwards is a brake]) I needed to get creative. I ended up using an internal gear 8 speed hub for the rear with a drum brake. 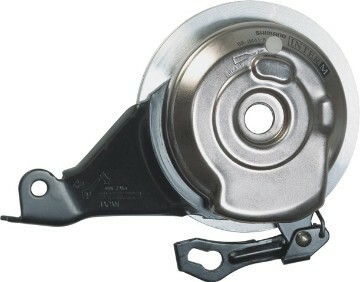 I can’t say that I love the drum brake, it’s heavy and a bit squishy – but it is nice to have a brake. I do love the internal hub though. Quick shifting, clean, and simple – Although also heavy. If weight is a concern for you go for the 3 speed internal hub by shimano which shimano at least claims is drum brake compatible (and much cheaper). 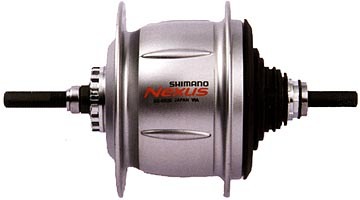 The only place I know of with a good deal on internal hub wheels is VeloOrange. Prices range from 140 to 260ish plus shifters and brake levers. If you have vertical or semi-vertical dropouts (explained above) you will need anti-rotation washers. Since these aren’t perfect geometry bikes you might need to find someone who sells these. I had to use two yellow washers but had to put them on the out side of the dropouts. NOTE: internal gear hubs require a special shifter (not brake levers). They need a lot of travel to shift gears, apparently regular shifters with travel agents don’t even cut it. 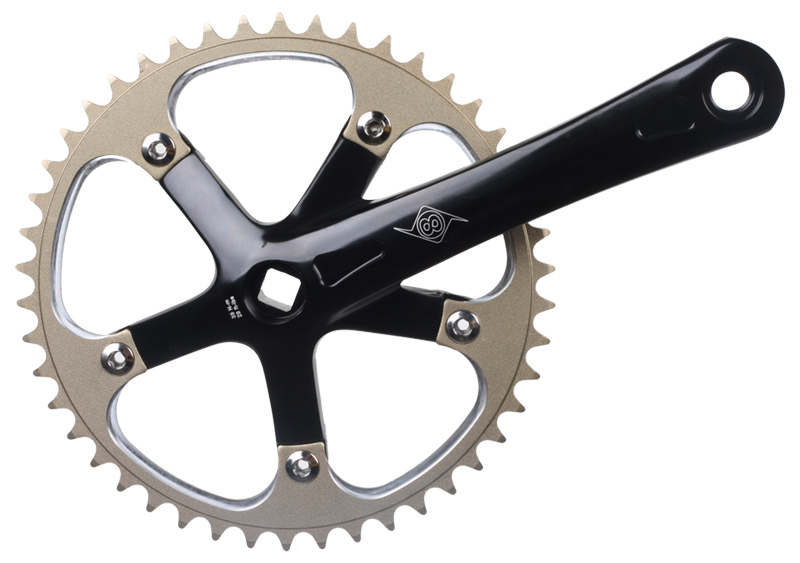 As for the crank I went with a origin 8 single speed cranks. 50$ at bikestop.com and there are some pretty sweet colors if your up for it. I decided to use a disk brake up front (where 70% of your stopping power is). I bought the Dimension cyclocross fork from Bikestop 1 1/8″ treadless (this size depends on your headtube diameter and headset) and shimano xt hydraulic disk brakes (which are often on sale at pricepoint.com). Note that you might have to buy a brake caliper adapter to fit the shimano brakes to the ISO disk brake mounts on this fork (note that the adapter is specific to the type of brake and fork, as well as the size of the rotor). I went with a 180mm ceterlock rotor (specific to shimano hubs but I think other companies are making them now). The larger the rotor, the more the stopping power – but realistically any size will do. For a front wheel I used a 29er mountain bike wheel (which is exactly the same as the standard 700c road wheel, only beefier and better sounding). This is the opposite of how all of my bikes are. Nice thanks for catching that. I appreciate it. Is the epoxy strong enough to prevent the bottom bracket from rotating while riding? It seems like you would want one that has a few inches of the tubes still attached to bind the bamboo to. So far I have had no trouble with my bottom bracket. Just make sure that you look at the discussion of surface preparation in the “metal bits” section of this blog. Also I haven’t heard complaints from others. If you are worried about it, maybe using a BB with luggs would simplify things. Although you should make sure that the luggs fit on the inside of your bamboo poles, so they don’t slip down. Very Cool To See! awsome blog! great info! I was just wondering if you’ve personally seen a coaster brake safely and effectively used on a bamboo frame. I’m doing a build of my own, and I’m leaning coaster brake, but I’m worried about the strange force angle of the brake arm against the chainstays. Am I worrying too much? Thanks. I think that is a legitimate concern. First keep in mind that you need horizontal dropouts b/c you wont be able to use a chain tensioner with a coaster brake. Second, the stress very well might be too much. I would consider filling the bamboo with epoxy through that section of the chainstay. I would also build up extra layers of hemp and epoxy or even consider reinforcing the area with carbon tow. I am working on building my bamboo bike now, and I got the metal bits from Nova a month ago or so. I am getting ready to start tacking the frame together but all my metal bits (the same ones you used) are a bit rusty… It has been a humid summer, but I am worried they’ll rust when they are on the bike. Do you know if there is anything frame builders do to treat these pieces before using them, or did you run into this problem and have a solution? I can clean them up but like I said, worried they’ll just rust again. Thanks for your help, your site is incredible. Gonna post an instructable for my build when I finish it. Yep… steal is a wonderful metal but prone to rusting. I would sand it down to get the rust off. AFTER you are done building the bike you might rub a tiny bit of light oil (not WD40, which is 1/2 solvent 1/2 oil). Thanks man. I will do that. I was just unsure if frame builders treated the metal somehow when they welded it or something. Also, I am really mainly worried about the dropouts since they will see the most air/water, the other bits being wrapped in hemp/epoxy, but I will treat it with oil and keep an eye on them. Thanks for your advice! Any exposed steel could be painted or clear coated to prevent rust but I would not be too concerned about the innards. Just oil what you can. Auto body techs use a product that inhibits rust on steel vehicle parts and is guaranteed for five years in preventing rust. I apologize, I do not know the name but, with some research you will find a good product for this application. Hey there! I’ve been reading your site for a while now and finally got the bravery to go ahead and give you a shout out from Lubbock Tx! Just wanted to say keep up the fantastic job! make some quite legitimate points. Anyone out there have any good advice for installing cantilever bosses on the rear triangle? You can buy good and cheap bamboo frame in Mekong Creation.